Everyone loves comfort food casseroles, and Slow Cooker Homemade Chicken Pot Pie from 365 days of Slow Cooking would fit the bill! And don’t you think that slow cooker chicken pot pie is an all American comfort food dinner that most people would like? Click for The Best Slow Cooker and Instant Pot Chicken Drumsticks Recipes! This delicious looking Slow Cooker Homemade Chicken Pot Pie from 365 Days of Slow Cooking is the perfect comfort food, and it’s an often requested dinner for Karen’s family. And spring is approaching, so you need to make this soon while the nights are still cold! 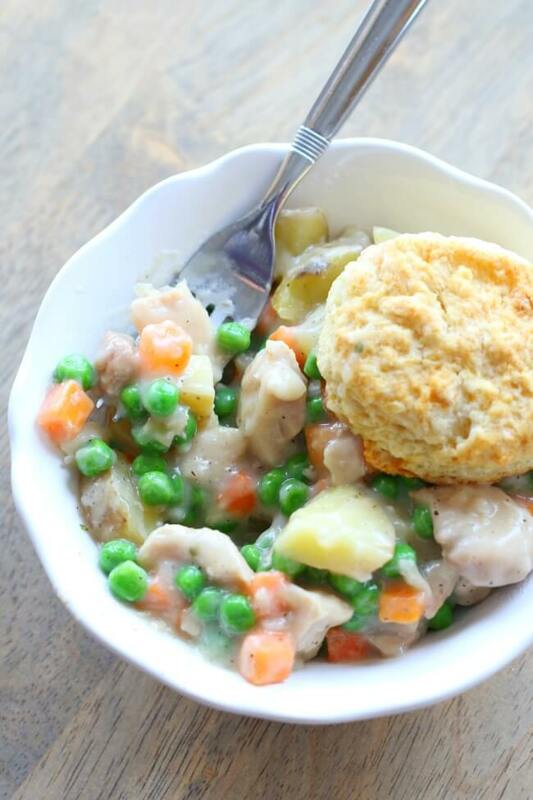 Karen uses homemade cream of chicken soup and homemade biscuits for this slow cooker chicken pot pie. Both those are linked in the recipe, but she says you can use purchased soup and biscuits if you prefer. And although we obviously prefer from scratch cooking on this site, do what works for your schedule so you don’t miss out on this tasty dish. Either way you this tasty slow cooker chicken pot pie, this recipe will probably become a family favorite at your house too! Get complete instructions for Slow Cooker Homemade Chicken Pot Pie from 365 days of Slow Cooking. Karen recommends using a 5 Quart Slow Cooker for this recipe.